Now prodded and shoved into a truck. Fighting destiny with skull and hooves. Our coffers are full but we can never have enough. Her legs moving so fast down that hill. Would he let her get away? To enjoy her life and be free again? Off to the knackery, where every cow goes. Or mourn their freedom and life lost. I’M WORRIED! ARE YOU OK? She loved me – she was my world! Gone now – gone forever. All I ever wanted was you! at the Planet of the Lonely Cows. 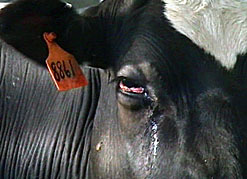 During the first week of February, 2007, two dairy farmers were brutally slain by cows in separate incidents for the same crime against nature. In Ohio, one cow killed a farmer after he separated mother from calf shortly after birth. In Australia, a dairywoman died for the very same reason. (Video links unavailable without subscription). Cows are not usually angry or aggressive creatures. The human act of separating mother from child is the most inhumane act to be found on a dairy farm. Those vegetarians who eat dairy products must take responsibility for this horrible lack of compassion, for that is the nature of the dairying business. The insult of marketing "Happy Cows" in California is no more than a deceptive lie. To be witness to the angry crying of the mothers, or the pathetically sad moans from the calves is to know and be haunted by an infinite sadness which all mammals share in similar circumstance. "Cows have the ability to reason. Sheep have remarkable memories. Pigs have sensitive feelings." Editor comment: The address for this citation does not work. Canadian researchers have demonstrated that dairy cows are more sophisticated than farmers realize.